I'm sorry that I have been m.i.a. for the last few weeks. I recently got a new job in the LA area, which I love, but the drive is killing me! 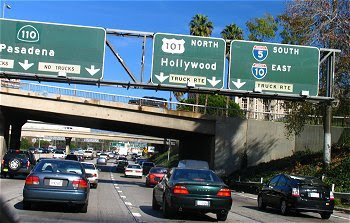 I live in a Los Angeles suburb, about 48 miles away from the city (I technically work in West Hollywood--if you are unfamilar with Southern California, it's where The Hills is based), but with traffic I have about a 4 hour round trip drive. I hope to move out to the area soon! As for my new job, it's at an event planning company that partners up with non-profit organizations to put on walk, bike rides, and other marathons that work to raise money for cancer research. I haven't been there for a full week yet, but it already feels good to know that I am working to help others, and potentially be a part of the cure for cancer. So, once again, I am sorry! I promise to try harder to keep up with this blog, as well as yours. 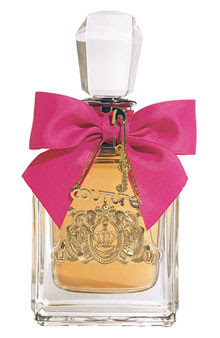 If you are looking for a great gift, I recommend the Juicy Couture "Viva La Juicy" Holiday Set. I recently bought this for one of my good friends, and really should have gotten myself a set as well. mandarins, honeysuckle, gardenia, jasmine, amber, caramel, vanilla, sandalwood, and praline. And the packaging is so adorable! ver, I made the mistake of buying a set at Macys and was charged $98. So go to Nordstrom if you're going to buy the set!! Any gift ideas you care to share? Thank you to all who entered the giveaway. I wish I could have chosen you all as winners. It was great hearing about all of your favorite beauty products; I'll have to try some of them out! Be sure to check back for future giveaway here on Join the Gossip! I am all about trying new cosmetics. So, when I was able to test The Body Shop's new Mineral Makeup Line: Nature's Minerals, I was immediately excited. I have to say, this is my first experience with the brand and I was thoroughly impressed. I am not really a big fan on most mineral makeup. I feel that it doesn't provide enough coverage for my personal needs. However, Nature's Minerals foundation works to conceal blemishes without looking too thick. I tested Shade 02, which was a bit dark for my complexion. But still a great color. The blush was just as great as the foundation. Once again I chose a beautiful color, Golden Terracotta. This blush is versatile; for a daytime look only a light amount of the powder is needed, and for nighttime glam, I use a little more on my cheeks. As for my favorite makeup item, eyeshadow, I was beyond pleased with the look that the Radiant Graphite provided. I am addicted to this shadow and wear it almost every single day. It's a flattering hue that will work magnificently on various skin tones. 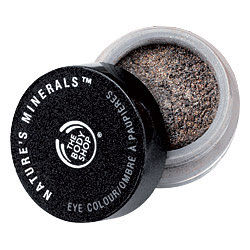 So The Body Shop Mineral Makeup sounds fabulous huh? That's because it is! So fabulous, in fact, that I want you to try it out for yourself. You can win foundation, blush, and eyeshadow--in your favorite shades--right here on Join the Gossip. Please leave a comment explaining your favorite makeup item (whether it be lipstick, mascara, etc. ), and why you just gotta wear it. One winner will randomly be selected, as long as they have answered the question, and announced on Friday, November 21. 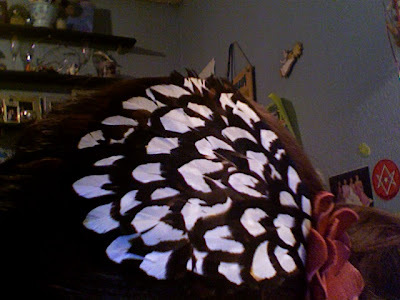 Recently, I posted a blog about Kenley's hair accessories and came across an Esty account that sells breathtaking headbands. 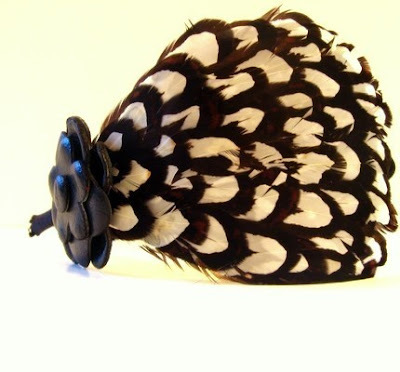 Well, after drooling over the gorgeous items sold by VieModerne, I decided to make a purchase: an AUDREY Black and White Feather and Leather Flower Headband. 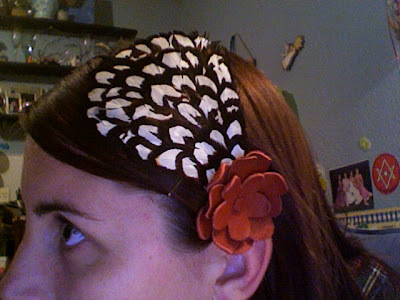 I asked that my headband be made with a red flower and the seller obliged. It was a bit over $40 with shipping, pretty pricey for me, but it's so fantastic that I couldn't pass it up. There are many 20s-inspired items featured in VieModerne's shop. Certainly worth a visit! 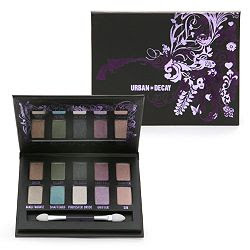 I just bought an awesome-looking Urban Decay Shadow Box Palette in Ammo on Beauty.com. The colors look beautiful, I can't wait to test them all out! I received free shipping, a 20% discount as a PayPal member, and wasn't charged sales tax. The item sells for $34, but with my discounts my total came out to be $27.20. So, I just had to post some pictures of the fabulous outfits that everyone wore this year! 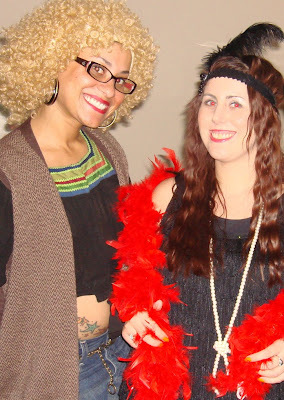 I was a flapper =) Found the dress at H&M!